In case you were not there last night, Mao had to be put to sleep last night. Our poor kitty whose namesake is the inspiration for this blog has died. She has been sick and on Friday we took her to the vet. It turns out that her FeLV+ (feline leukemia) has finally taken its toll on her tiny body and she took a turn for the worse. It became a question of when not if. 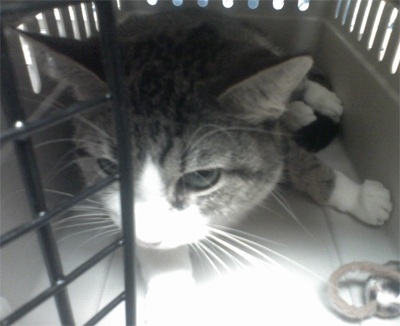 We took her home with the hopes that the medicine would help but in the end hopefully it just made it more comfortable. She had not been eating unless it was forced and the final nail in the coffin came last night when she, on her way back to her laying spot from using the litterbox, could barely walk and was stumbling over her feet. So at 10:00pm last night we drove to the all night animal hospital and here we are now. What really makes this hard is that this is the first pet I have owned that was mine. This wasn’t a family pet like the dog I had when I was a kid. This was the first pet I got with Becca and even then it was because she knew I needed something small and furry to take care of. We always knew she was sick with FeLV+ but she never showed it and was always a meowing machine. All I can say is that at least her last 9 months were spent in a home that loved her rather than in the shelter where we got her. There will be no further posts today. We all loved you Mao, even in all your nonstop chattering. The party has lost it’s Leader.